Number four made me lol! OK, maybe “lol” is an overstatement. And that’s the trouble: BuzzFeed has hired a lot of ex-broadsheet reporters to make a determined run at hard news, and putting a “serious” feed alongside the usual gif-heavy listicles seems to be working. This could be a problem we in the old media need to respond to. I’m just not sure we’ve got the, er, range of material at the moment. Of all the innovations that new media is credited with making, what BuzzFeed is doing now might be the most fundamental. For as long as there have been newspapers, there have been tabloids and broadsheets. But I’m not aware of any media outlet that has tried being a broadsheet and a tabloid at the same time, and most certainly not on the same page. This goes far beyond the “funnies” in American newspapers or the “and finally … ” items on TV news, carefully left to the end of the run. This is side-by-side gravity and irreverence at the top of the homepage. And it might be a transitional phase, but it’s hard to imagine BuzzFeed as just another straight news source with none of its trademark “buzz”; it’s very possible that this is the final concept. In which case, I’m not sure we old-media types have anything to counter it with, unless the non-farm labour statistics are particularly upbeat over the next few months. Newspapers have followed new media onto the web, into the blogosphere and across Facebook and Twitter, and done very well at it. But this looks like one path that we can’t go down at all. Up at the top of the Guardian’s US website last week, everything seemed normal. There was the 9/11 anniversary, James Clapper, the shootings in Colorado, a police killing in LA, the Republican race; and foreign news from Syria, Hungary and Japan. Oh, and one item of British news too. But not about the British prime minister; nor even about the leader of the opposition, little though that person is generally known in the States: about a politician who at that point had never held any kind of frontbench job, or even won the election he was standing in. Corbynmania hasn’t just come to Britain: it’s cracked America too. Why might this have happened? A look further down the US homepage, at the “most popular” listings, gives us a bit of a clue. The Guardian’s national homepages, for Britain, Australia and the US, are carefully editionalised, but the top ten most popular rankings, as we have discovered before, remain global lists, blindly counting all the clicks with no distinction made as to where they came from. So while Guardian US readers scanning the top stories get a familiar choice of topics, those wanting to find out what’s hot on the site today are presented with very different choices: Labour; Labour; American TV; Labour; European refugees; Labour; football; cricket; a UK reality show; and an acutely British scandal about two barristers having a row. American readers might find, at best, three out of 10 of those stories familiar. But the priorities of Guardian readers as a whole are obvious from the list, even if you don’t recognise any of the names: Jeremy Corbyn and the Labour leadership election are hot. 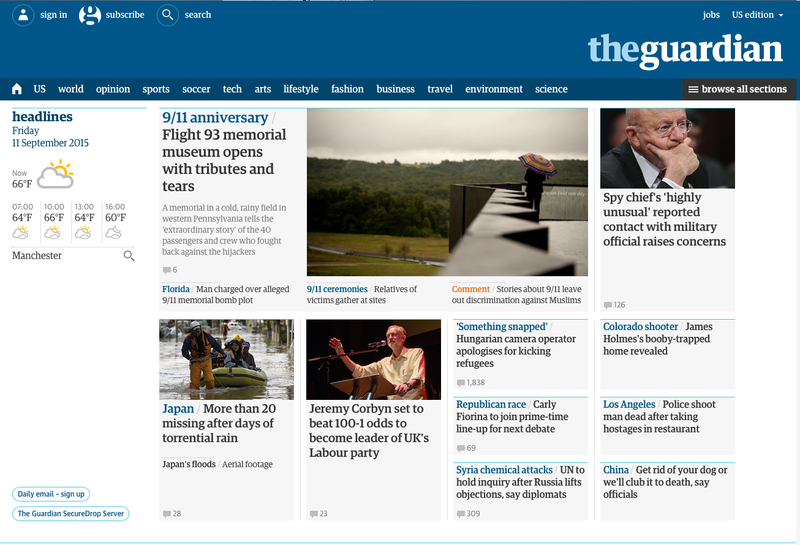 The US website is an American publication, certainly, but a Guardian publication too: a balance needs to be struck between local stories and “Guardian stories”. So Jeremy makes the front page, with a concise explanation in the headline of where’s he’s from and why he’s news. Tony Abbott, the suddenly-now-deposed Australian prime minister, has made it to America too, and not just as a piece of “other news”. He’s the US splash – a splash about a man who runs a country of 23 million people, 10,000 miles away. This isn’t just a British news organisation bringing British news to America: this is a British news organisation bringing Australian news to America. This is a cross-fertilisation of agendas that goes far beyond London Calling or the BBC World Service. 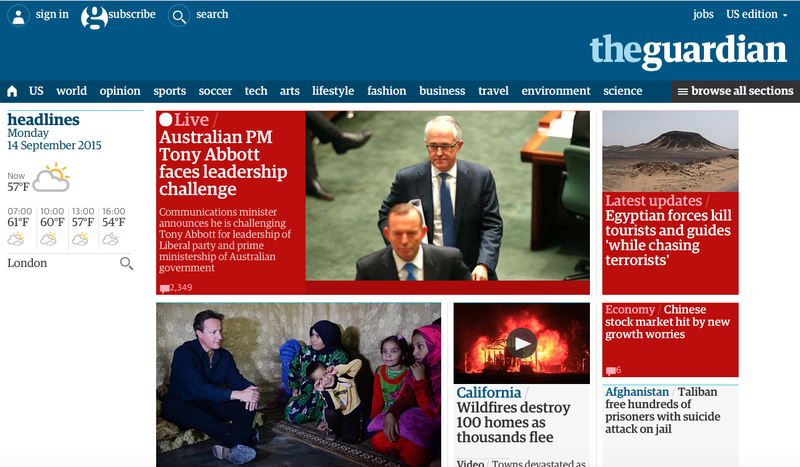 Tony Abbott’s name is in lights on all three Guardian websites. 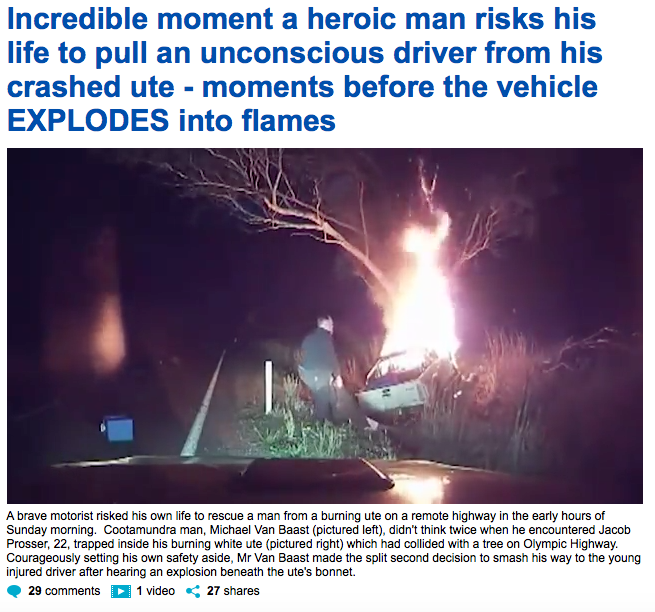 He’s become the lead story on Anglosphere News. Yes, managers, editors, and news brains – as they travel from country to country, setting up newsrooms, recruiting staff, instilling culture – bring their home sensibility to their new nation’s reporting. They do change the news. But, at the same time, the news changes them. Once you have experienced firsthand the excitement of an Australian “leadership spill” – a political party’s out-of-the-blue uprising against its own leader or prime minister – it stays with you. Then, when you have moved on to your next country, and you hear of another one, your news sense – broadened by travel, fine-tuned by personal experience – is awakened again. You pollinate your new office with the excitement you remember from your old one. The insularity that would once have stopped you running the story has gone: only the journalist’s enthusiasm remains. Within six hours of the story of the spill breaking, Tony Abbott was out and Malcolm Turnbull was in: a national leader democratically challenged and toppled in 350 minutes from start to finish. How can that not be news? As I write, the live blog on Abbott’s downfall is up to second place on the Guardian’s global popularity list, but Australia has been wide awake and clicking all day. How did it play overnight in Dallas-Fort Worth? We can’t tell. But it’s early in the US. Heat maps on news websites show that people visiting a newspaper’s homepage click on the lead article more than anything else on the site; if we think it’s news, it seems, loyal readers are prepared to take a look at it. And some stories really do deserve a wider audience.